WASHINGTON, DC -- U.S. Vice President Joe Biden and Ukrainian Prime Minister Arseniy Yatsenyuk have urged Russia to fulfill its commitments under the Minsk agreement, which calls for a political solution to the conflict in Ukraine and a de-escalation of military involvement. 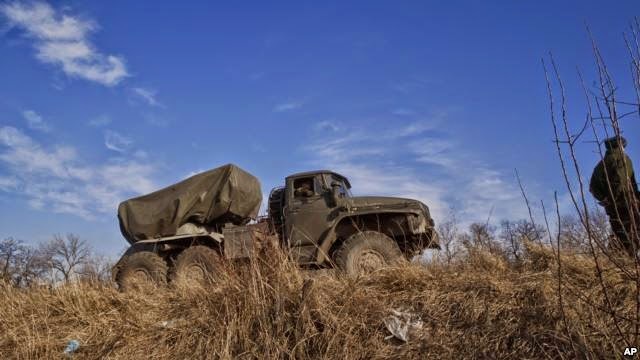 A truck equipped with a Grad rocket launch system is seen outside Donetsk, eastern Ukraine. The White House said the two men issued the appeal Friday in a phone conversation that focused on the security situation in Ukraine and the country's reform agenda. The Minsk agreement calls for the withdrawal of all heavy weapons and foreign fighters from eastern Ukraine, the release of all prisoners in Russian custody, and allowing Organization for Security and Cooperation in Europe election monitors to begin preparations for local elections. On Thursday, the head of the U.S. European Command, General Philip Breedlove, said Russia could to be gearing up for another military offensive in Ukraine based on its past actions. His assessment is in stark contrast to the impression Russian President Vladimir Putin conveyed to former global leaders during a two-hour meeting in Moscow. In an exclusive interview with VOA, former U.S. President Jimmy Carter, for his part, said he was pleased with Russia's commitment to implement the Minsk agreement. "And, I don't think there's any doubt, there's not any doubt in our mind, that the Russians genuinely want to see all the aspects of that concluded," Carter said. Carter and other former global leaders met with Putin for two-and-a-half hours Wednesday in Moscow. The group, called the Elders, visited at a time when Russia's relations with the West are severely strained over Moscow's seizure of Crimea and the deadly conflict in eastern Ukraine. The Minsk agreement was reached in February by France, Germany, Russia, Ukraine and pro-Russia separatists. It envisions a cease-fire and withdrawal of foreign troops and heavy weapons leading to a lasting, legal and political solution to the conflict in Ukraine.